As personal assistant to Kraus-Anderson Chairman Lloyd Engelsma from the mid-sixties through most of the nineties, Jan Goebel has seen a lot of Kraus-Anderson history. These days the retired KA corporate secretary is helping preserve that history, in her second career as KA historian and curator of the KA History Center. Over the past 15 years or so, Goebel has toiled away, quietly organizing and cataloging the KA history department, tucked in a modest corner of the downtown Minneapolis headquarters building. Now that building itself is set to become history, as Kraus-Anderson prepares to break ground on its new headquarters block, anticipated this spring. So recently, Goebel and the KA History Center moved to a new, temporary location at 4200 West Old Shakopee Road, Bloomington, MN, next door to KA Realty Company. As she settles into her new digs, she filled us in on some of our history. Q: What is the KA History Center? Why and how did it get started? 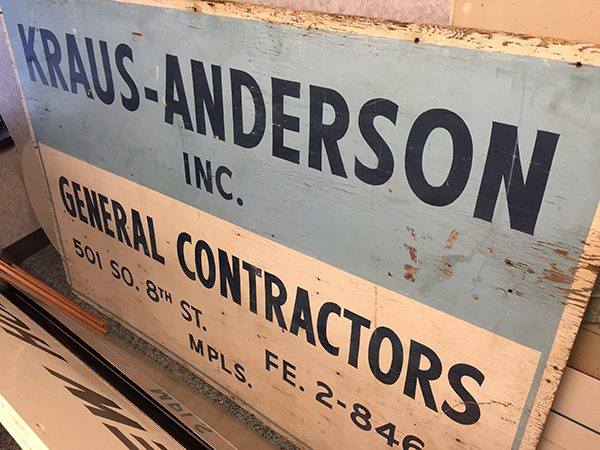 GOEBEL: The KA History Center is our Kraus-Anderson archives, with electronic and actual records and artifacts relating to our Kraus-Anderson family of companies and its employees—past, present, and future. Its focus is separate from KA’s daily go-to CRM and marketing databases. Our collection is more about our heritage, tracing client and community relationships that in some cases go back a century or more. And we have a lot of materials that speak to our brand and our culture over the years. Q: What sort of items are in the collection? GOEBEL: It is a diverse assortment, running the gamut from business ledgers and legal documents to whimsy. There are many people and project photos and renderings, old articles, newsletters and clippings, brochures, oral and written histories, giant post-bound ledgers, mementos from project milestones, souvenirs from parties and celebrations. There is a hand-built, miniature Ice fishing house from a charity fundraiser. Elevator doors from when we operated a company that makes elevator cabs. Paste-up boards from the old KA advertising agency, which served KA shopping centers. Also many permutations of our KA shield, ranging from treatments in greens, browns and oranges to our current, trademarked brand. In all there are over 10,400 items in our collection database. Q: Are all the items stored in the History Center? GOEBEL: Downtown we had just 300 square feet, so a lot of items were in deep storage. Now we have 1,300 s.f., which allows us to spread out and work on putting our collection into shape! Q: How did you become the KA Historian? GOEBEL: It just sort of evolved. When I first started working for Lloyd, I opened all his mail and passed it in. Lots of pictures, awards, etc. never came back out and I wondered what he did with them. One day I decided to look around his office and I found nothing until I got to his waste basket. There I found a beautiful award with gold stickers, ribbons, et al. From then on, I had the cleaning people give his waste basket contents to me the next day; and eventually I convinced him to give them directly to me. In 1987, we celebrated 50 years of Lloyd’s leadership at KA and that spurred me on to collect even more history; as did our centennial celebration in 1997. A few years later, we engaged a professional historian, Penny Peterson, to dig more thoroughly into the public records, and we conducted interviews and collected the memories of many employees and business partners going back to the 1930’s. The result of that digging was the publication of our KA history book. After Lloyd died, I was left sort of rudderless. I had worked for him 30+ years. So it was decided that I would catalog all the information we had and put it in a database and here we are 19 years later. Q: What’s the oldest item in the collection? 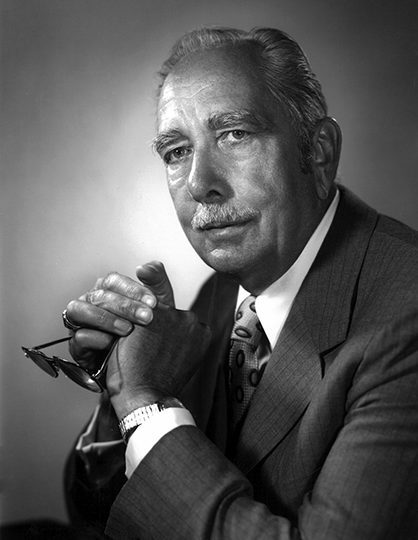 We have records going back to the 1880’s, relating to the original founder, James L. Robinson. One of the oldest artifacts is a handwritten minute book dating back to 1913, when the company was the J.L. Robinson Company. It shows the 1930 sale of the company to Robinson’s two employees, Mr. Kraus and Mr. Andersen (with an –en). A few years later, they sold it to a young fellow named Lloyd Engelsma. The rest, as they say, is history. Q: Will the history center be part of future new KA headquarters? GOBEL: Yes. We are planning for a small interactive display, and also working on having some select artifacts displayed throughout the new offices. I’m excited to see how it all works out. Q: Who uses the History Center? Is the public welcome? GOEBEL: Up until now, it’s been a relative few emissaries who come in to research for various purposes- marketing, retirement parties. Working on the redevelopment of 430 Oak Grove, a few years ago, we dipped into the records as we had initially built the building in the 1920’s. On occasion clients would notice the “History dept.” sign and express an interest in seeing what is going on in “that room.” We’re planning to bring on an archivist to help us take this to the next level. Meanwhile, all are welcome, by appointment. Q: What is your message to employees, especially those in the KA Minneapolis office who are currently in purge mode as we prepare to move? GOEBEL: As you purge your files, drawers, etc. keep HISTORY in mind. Photos, brochures, sales pieces, promotion items, awards, recognitions, lists, media- all are potentially valuable pieces of our history. And if you have stories to share, record or write them down and send them to me. That is good stuff.